One such company is Kaanapali Land LLC. “KLL” traces its roots all the way back to 1849, when German boat captain Heinrich Hackfeld arrive in Hawaii and started a general store. The store was a success, and Hackfeld expanded into many other ventures, including lodging, sugar production, and import/export activities. H. Hackfeld & Company eventually became one of Hawaii’s largest land-owners, at one point holding 60,000 acres. All was well until World War I, when the US government confiscated the company under the “Trading with the Enemy Act.” At the time, the loyalties of German-Americans, even those who had been US residents for generations, were considered suspect. The government auctioned the company’s assets to a group of Hawaiian businessmen, who renamed the business “American Factors.” The company’s sugar business grow rapidly and was the company’s main source of profits until Hawaiian tourism took off in the 1960s. American Factors profited handsomely by expanding its lodging and resort operations and by selling land for development. Over the next few decades, American Factors (renamed “Amfac” to match corporate conventions of the time) followed the 60s and 70s playbook of continual expansion into a wide range of unrelated industries. As often happened in such cases, Amfac eventually found itself unfocused and over-leveraged. A series of divestitures and complicated transactions meant to fend off hostile takeovers left the company less indebted but still not reliably profitable. Multiple loss-making years eventually forced the company to accept a $920 million buyout offer from a major Chicago-based real estate company, JMB Realty. JMB set about slimming Amfac down to its agricultural and property development roots, hiving off or selling all the mainland operations and contributing various other Hawaiian assets to other JMB companies. Unfortunately, sugar production in Hawaii was in terminal decline and Amfac Hawaii declared bankruptcy in 2002. Amfac Hawaii emerged from bankruptcy in 2005 as Kaanapali Land, LLC. 167 years after Herr Hackfeld opened his shop on Maui, what remains in Kaanapali is 4,000 acres of Maui land, some $25 million in cash, a $22 million pension surplus, and various minor current assets and liabilities. The company’s only activities are managing and monetizing its remaining real estate, as well as dealing with some residual legal actions related to bankrupt subsidiaries that are now in liquidation. The company is working on gaining approvals for its Ka’anapali 2020, Wain’e, and Pu’ukoli’i Village developments, and it has successfully created an innovative agricultural/residential development in Ka’anapali Coffee Farms. Of the 51 lots at Ka’anapali Coffee Farms, 12 are still available for purchase. 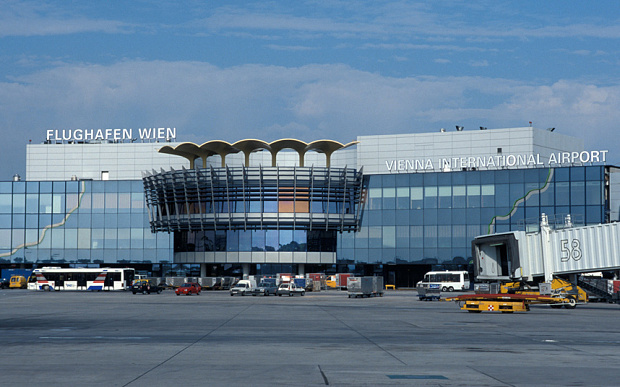 The company’s website contains detailed project plans for each development, with videos and maps. In all, the three proposed developments will account for just over half of Kaanapali’s developable land. (Of the company’s 4,000 acres, 1,500 are protected conservation lands.) Problem is, approvals for new development can take a long time in Hawaii, where a fraught history often results in strong local opposition to real estate projects. Kaanapali has made great efforts to work with the local community in planning these developments, including committing to infrastructure improvements and affordable housing. But that is no guarantee that actual development will begin soon, or at all. Interestingly, Kaanapali has disclosed that it signed an agreement with a third party to sell all of its landholdings for $95 million in January, 2016. However, the unidentified buyer eventually backed out and the deal fell through. The company also had an agreement to sell its Pioneer Mill site (essentially, the proposed Wain’e development) for $20.5 million, but that deal also fell through. The proposed sale price for all of Kaanapali’s acreage works out to $38,000 per acre. The price for the 200-acre Pioneer Mill site alone was $102,500 per acre. Though neither deal actually went through, the failed transactions provide a helpful yardstick for valuing Kaanapali’s land. At the current trading price, investors in Kaanapali are buying developable Maui land at a price of just $10,900 per acre, net of corporate cash. If we credit the company for its pension surplus, the effective price falls to just $2,100 per acre. (Crediting the company for the full value of its pension surplus is dubious, as actually accessing a pension asset is a difficult proposition.) Either price is a fraction of what the land is likely worth, but then again there is substantial doubt as to the feasibility and timing of actually developing that land. Still, I don’t know of a cheaper way to buy Maui land, even if indirectly. Potential investors in Kaanapali should be aware that the company is not current on its financial filings, though it is working on filing updated annual and quarterly reports. The company neglected to file these reports for some time, though it has nearly 700 shareholders of record. An SEC notification set the company on the path toward current filing status. (Turns out, there is a point at which the SEC will intervene on behalf of shareholders in an unlisted company. Who knew?) The most recent financial statement data is as of June 30, 2015, though the company has disclosed all material events since that date. Potential investors should also be keenly aware that realizing value from Kaanapali’s assets could take an extremely long time, if it ever happens at all. Finally, potential investors should consider Kaanapali’s extremely tiny float: only about 330,000 units are free-floating, with a current value of around $10 million. Author David Waters owns one unit of Kaanapali Land, LLC, so he can talk about his getaway in Maui. Essentially, Urbana was trading at a gigantic discount to the value of its holdings and aggressively repurchasing its shares. It seemed like a good recipe for success, but there were also a few red flags. For one, management seemed to enjoy buying tangential assets like gold mining stocks and other things far outside the fund’s core strategy. Management had also begun making investments in related-party companies, creating the possibility of conflicting interests between management and shareholders. Finally, Urbana’s operating and management costs were high in relation to its asset base, and management was firmly in control via its ownership of the firm’s voting shares. Weighing the discount to NAV and the ongoing share repurchases against these negatives, I chose to pass on the company and didn’t give it another thought until yesterday. Turns out, I passed on a decent rate of return. Over the last five years, Urbana’s A shares returned 98%, well in excess of market averages. The strong return was driven by a combination of appreciation in the firm’s investment holdings, and by continued share repurchases. It’s hard to over-estimate just how seriously Urbana has taken its repurchase program. Since the end of 2009, the company has repurchased 39% of its shares outstanding, always at significant discounts to its net asset value. These accretive share repurchases have had a major positive effect on Urbana’s NAV, which has risen from a low of CAD $1.70 per share at year-end 2011 to CAD $3.75 now, a 15% annualized rate. Urbana’s current trading price is CAD $2.26, a 40% discount to NAV. But what sorts of holdings does that NAV include? Unfortunately, the proportion of non-traded assets in Urbana’s portfolio has grown, and that makes it more difficult to pin down a precise value for Urbana’s holdings. Urbana reports its holdings and NAV on a weekly basis. Investments in publicly-traded assets make up 56% of Urbana’s assets. Large American and Canadian banks and securities exchanges represent the majority of these public holdings, though Urbana also has holdings in Canadian materials stocks. Despite my dissatisfaction with Urbana’s propensity to invest outside its wheelhouse, I must admit the investments in “Canada, Inc.” (management’s terminology) were well-timed and have performed well. The private side of Urbana’s investment book is more interesting. The largest of Urbana’s private holdings is Real Matters Inc. Real Matters is a real estate technology company providing appraisals and valuations to banks and insurers. Real Matters has been a home run investment for Urbana, though Real Matters is strongly levered to the potentially over-heated Canadian real estate market. Most controversially, Urbana has invested in a private financial company owned by Urbana’s CEO, Thomas S. Caldwell. The company maintains that investments in Caldwell Financial Ltd. are done at valuations of one-third to one-half of what Caldwell Financial would fetch in private sales. I have no reason to believe this is not so, but these related-party transactions introduce an element of additional uncertainty in evaluating Urbana’s holdings, and require investors to exercise a greater degree of trust in management. Urbana management has indicated it will continue to buy back shares aggressively, but also notes that large blocks of class A shares are becoming more difficult to source and that the pace of repurchases may slow. Shares at current prices offer a way to purchase an otherwise inaccessible collection of private exchanges and other intriguing assets at a large discount to NAV. 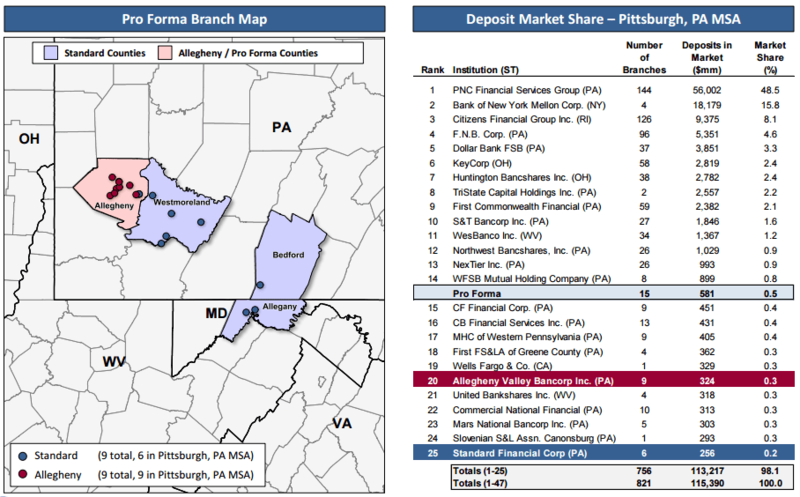 I don’t know if these underlying assets will provide strong returns in coming years, but continued share repurchases should help grow Urbana’s value per share. Investors will have to judge for themselves if the 40% discount to reported NAV is large enough to overlook the company’s high management costs and complicating related-party transactions. Alluvial Capital Management, LLC does not hold shares of Urbana Corporation for client accounts. Alluvial may buy or sell Urbana Corporation shares at any time. Back in late 2014 I wrote about Rand Worldwide, a software reseller and training provider of design products like AutoCAD. At the time, the company had just announced it would repurchase more than half its shares outstanding, allowing Peter Kamin’s 3K partnership to take control. I was bullish on the company, pointing out Rand’s cheap pro forma valuation on both current results and the company’s projections. I purchased shares then for clients and continue to hold them. So, how has the company done since? It’s a mixed bag. Rand has failed to live up to the cheerful revenue and profit outlook it put forth in its tender offer documents. Revenues have actually declined somewhat since. But, the company has been extremely successful in defending its excellent margins and generating cash flow. The debt the company used to finance the share repurchase has already been reduced by 40% to $12.6 million. Rand recently released its results for the quarter ended March 31, 2015. 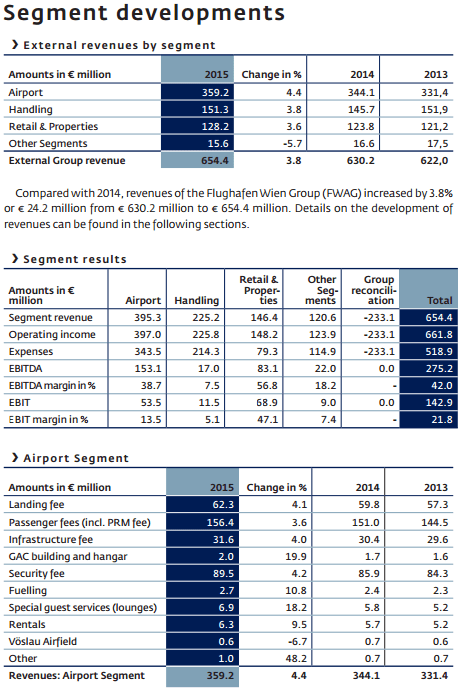 Let’s compare those results to the financial projections the company provided during the tender offer. For those projections, I’ll be using weighted fiscal 2015 and 2016 projections, since fiscal 2016 has one quarter left to go. Thus far, Rand has fallen far short of its revenue goals, coming in fully $17 million shy of its target. Much of this shortfall can likely be blamed on the revenue model transition that Rand Worldwide’s largest supplier, AutoDesk, is undertaking. AutoDesk is transitioning from a traditional software license sale model to a subscription model. Often, these transitions result in some degree of business interruption for re-sellers and other ecosystem participants. AutoDesk’s revenues have fallen during this transitional period, but the changeover is going well and subscription counts are rising steadily. There may be signs that the worst is over for Rand as well. 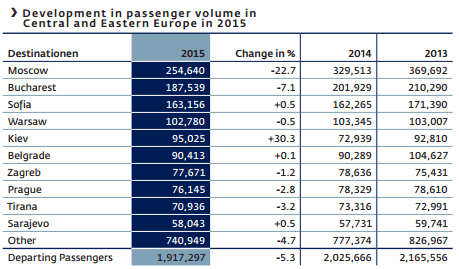 Revenues for the most recent quarter rose year-over-year for the first time since 2014. Rand has done better on the expense front, managing to post a 52% gross margin and hold down operating expenses during period of slow sales. But so far, the upshot is operating income well below plan. This lackluster operating performance is likely the reason why Rand’s stock has treaded water since 2014. While Rand’s operating results may have been lackluster, the company’s aggressive deleveraging actually makes it just as attractive today as it was back then. Rand’s $9.5 million in EBIT and enterprise value of approximately $75 million yields an EV/EBIT ratio of 7.9. That’s fairly cheap for a company that earns pre-tax returns on capital north of 35% and generates gobs of free cash flow, especially if Rand’s revenues are returning to a growth path. In order to get an idea of what Rand’s controlling shareholder may decide to do with the company, it’s worth looking at some of the other companies that Peter Kamin and Company control, like Calloway’s Nursery, Rockford Corporation, and Abatix. In general, 3K likes to increase its ownership over time via open market purchases or tender offers before ultimately purchasing a company outright. In other cases, 3K holds its ownership steady but directs its controlled companies to pay out large special dividends from time to time. In my view, 3K will have eventually utilize Rand’s increasing debt capacity to fund another large tender offer. The initial loan agreement allowed for total debt of up to 2.75 times EBITDA. Using the same assumptions, Rand currently has the capacity to take on an additional $17 million in debt. If Rand were to announce a debt-financed tender offer tomorrow at say, $2.50, then the company could buy back around 6.8 million shares, or about 20% of the outstanding shares. Question is, will 3K act soon, or will they allow the company to pay down debt by a few million more first? That would allow Rand to buy back even more shares, but it also increases the risk that Rand would have to pay substantially more for the shares if business results trend well. Either way, I think current shareholders win. Alluvial Capital Management, LLC holds shares of Rand Worldwide, Inc. for client accounts. Alluvial may buy or sell shares of Rand Worldwide, Inc. at any time. Continuing on the theme of California real estate, today’s post concerns LAACO, Ltd. LAACO is a California partnership. At I write, the partnership has 169,985 units outstanding and a market capitalization of around $338 million. (Units trade at a fairly wide bid/ask spread.) LAACO’s business is real estate. The partnership’s name comes from its ownership of the venerable Los Angeles Athletic Club, but the partnership also owns over 50 self-storage operations as well as some other land holdings in Los Angeles. LAACO is extremely well-run, only modestly leveraged, and trades at a very attractive multiple of net operating income. I’ll get into the details of LAACO’s holdings, but let’s start with a look at the headline numbers. In 2015, LAACO produced net operating income of $25.7 million. Net operating income, or NOI, is a very important figure in real estate investing because it is a good estimate of the cash flow that properties produce. It isn’t the end all, be all, because it excludes the normal capital expenditures that all properties require. But it is useful shorthand for comparing prospective acquisitions. Naturally, more attractive properties tend to trade at higher multiples of NOI/lower NOI yields. Properties with good potential for increasing cash flows and those in areas with restrictions on new construction also tend to trade at high multiples/low yields. LAACO’s properties satisfy both of these characteristics. The Los Angeles properties are located in desirable areas where constructing new buildings is both difficult (for lack of available land) and expensive. The self-storage facilities enjoy very high occupancy and great potential for rate increases. LAACO has net debt of $31.1 million, giving it a total enterprise value of $369 million. Using the $27.0 million NOI figure gives an estimated NOI yield of 7.3%. For those of us not living in coastal metropolises, that may seem like a pedestrian figure. Here in Pittsburgh, its still possible to buy multi-family properties at cap rates of 10%, 12%, or even higher. This is not the case in LAACO’s markets, nor in the self-storage industry. In Los Angeles, CBRE put NOI yields for full-service hotels at 6.5% in the second half of 2015. NOI yields on self-storage properties are even lower. National self-storage REITS are currently trading at NOI yields between 3.6% and 4.0%. (To me, purchasing at this valuation seems like a recipe for losing money, but hey, that’s where the market currently is.) The point of this exercise is simply to show that the market is valuing LAACO far, far below comparable businesses. LAACO’s self-storage business, called Storage West, was founded in 1978. Currently, the company operates 52 locations, 50 of which are wholly-owned. These properties are located in California, Arizona, Nevada and Texas. For 2015, Storage West’s properties reported 87% occupancy, with rents rising 4.5% to $14.59 per square foot. The company is working on developing three new properties near Houston and improving two existing Orange County locations. Storage West has indicated a preference for developing new properties from the dirt up over buying additional existing properties, citing unattractive valuations for seasoned self-storage facilities. A combination of solid operations and increasing national demand for storage facilities has enable Storage West to produce some excellent results. Storage West produced NOI of $24.5 million in 2015, compared to only $17 million in 2010. That’s a healthy 7.6% growth rate, and the company’s results should only continue to grow as rent increases take effect and new properties are brought to market. In 2016, Storage West should be able to produce at least $25 million in net operating income. LAACO also owns 50% interests in two additional self-storage properties, which produced $601,000 in income in 2015. 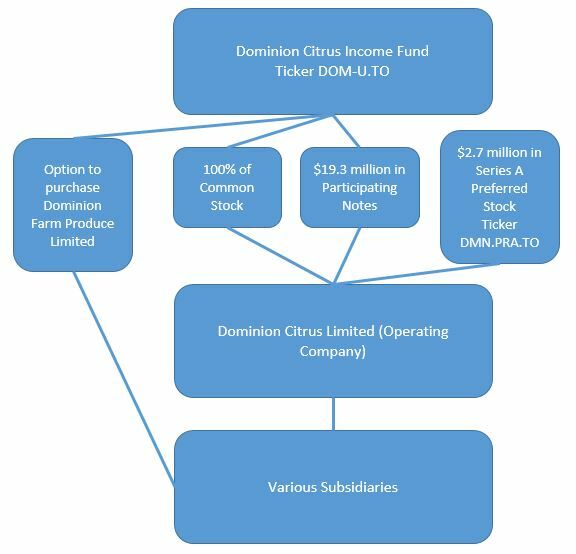 Assuming margins in line with Storage West’s wholly-owned properties, these joint ventures produce at least another $130,000 in depreciation, meaning LAACO’s share in the NOI of these properties is around $731,000. Adding this figure to the estimated $25 million in NOI from the wholly-owned properties gets us to $25.7 million in NOI. So what’s that worth? Large national competitors trade at 25-28x net operating income, but I don’t want to be that aggressive. I’ll instead use a more conservative 20x NOI, which still yields a value of $514 million using the $25 million NOI estimate. 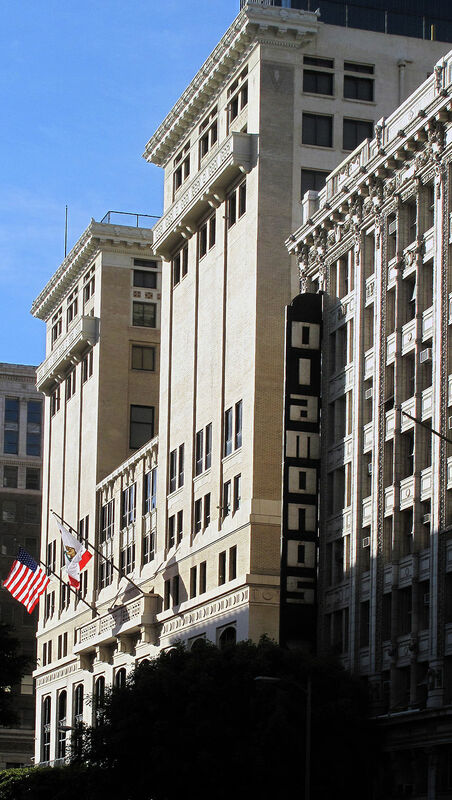 LAACO’s other major asset is the Los Angeles Athletic Club. Founded in 1880, the LAAC has counted many prominent Los Angeles citizens among its membership over the years. The club’s athletic facilities have helped train generations of athletes, including dozens of Olympic medalists. Today, the Club operates a 72 room boutique hotel, event and meeting space, plus dining and athletic facilities for its members. For tax reasons, LAACO leases the Club’s land and building to a fully-taxable subsidiary, LAAC Corp. In 2015, LAACO received $804,000 in rental income from LAAC Corp., and LAAC Corp. earned after-tax income of $276,000. Depreciation of Club assets was $552,000 for total cash flow to LAACO of $1.63 million. In 2014, cash flow to LAACO totaled $1.67 million. Using CBRE’s cap rate estimate for full-service Los Angeles hotels provides an estimated value of $25.7 million for the property. However, there are many reasons to believe this figure underestimates the value of LAACO’s Los Angeles real estate substantially. First, the company is in the midst of an extensive renovation of the Club’s facilities, which should provide an uplift in both revenues and profits. More importantly, the company also owns an adjacent parking garage, plus an empty lot, all located contiguously. The neighborhood is undergoing a meaningful amount of redevelopment, with Whole Foods (ever the bellweather) going in just two blocks away. Through the magic of Google Streetview, I present a look at LAACO’s downtown LA property. From left to right is the vacant lot, currently surface parking, then the parking garage, then the Club itself. LAACO controls the air rights on all three lots. If the trajectory of downtown Los Angeles can be sustained, it is easy to see millions in value being created from the redevelopment of the vacant lot and possibly the existing parking garage. Valuing LAACO as a whole is relatively straightforward. Conservatively estimated, the self-storage assets and the LAAC are together worth roughly $539.7 million. Against that value, there is $31.1 million in debt. Finally, LAACO pays annual management expenses to a company called Stability, LLC. Stability is controlled by the family that also owns the majority of all LAACO units, the Hathaways. Stability receives 1% of LAACO’s distributions to shareholders, plus 0.5% of LAACO’s total revenues. In 2015, this amount totaled $597,000. Conservatively capitalizing this fee stream at 20x the 2015 fee yields a liability of $11.9 million. Using these figures, each unit of LAACO is worth $2,922, or roughly 47% more than the current mid-point. This value does not include potentially lucrative development. Each $5 million in value created by redevelopment would benefit LAACO units by $29 per unit or so. It could add up. 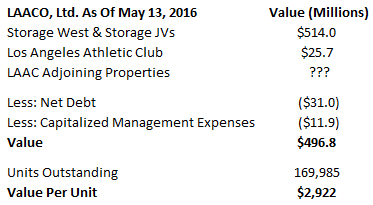 Finally, just as a thought exercise, what if we did value the self-storage business at a 4% NOI yield? Well, turns out doing so would increase the value of LAACO units by $128.5 million, or a cool $756 per unit. Do what you like with that. As you can see, its not hard to arrive at a value for LAACO units that is substantially above where the units are trading today. Units are illiquid, and the company is tightly controlled by the Hathaway family, but LAACO could be a nice “lazy” holding for long-term investors. Alluvial Capital Management, LLC does not hold units of LAACO, Ltd. for client accounts. Alluvial may buy or sell LAACO, Ltd. units at any time. One unusual company I have enjoyed following over the years is The InterGroup Corporation. InterGroup sits at the top of a strange trio of related companies. This odd triangular ownership structure, as well as the very low liquidity of each company’s stock, conceals significant asset value. Arriving at a reasonable estimate of each company’s value requires some legwork. 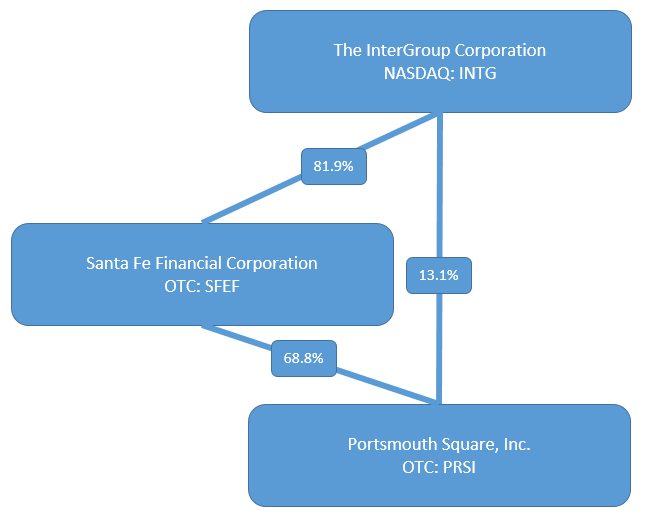 InterGroup owns 81.9% of Santa Fe Financial, which in turn owns 68.8% of Portsmouth Square. InterGroup also holds 13.1% of Portsmouth Square directly, giving it an effective ownership interest in Portsmouth of 69.4%. InterGroup is NASDAQ listed, while Santa Fe and Portsmouth trade over-the-counter. This chart casts some light on the clunky structure. In order to determine InterGroup’s value, we must start at the bottom and work backwards. 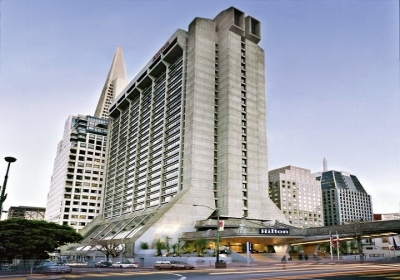 Portsmouth Square’s major asset is the entire group’s crown jewel: the San Francisco Financial District Hilton. Built in 1971 and renovated in 2006, the hotel has 32 floors with 544 rooms. While it is perhaps not the most beautiful structure (the influence of Brutalism is obvious) it is nonetheless an extremely valuable property. Through its subsidiary, Justice Investors, Portsmouth Square owns a 93% interest in the hotel. For the twelve months ended December 31, 2015, the hotel produced net operating income of $10.5 million. In fiscal 2015, the hotel produced NOI of $9.8 million. Hotels are often valued using cap rates, and these are especially low in a desirable city like San Francisco. Using a cap rate of 5% would value the hotel at $210 million. Using 6% would put the hotel at $175 million. This valuation is supported by the company’s own estimates. In late 2013, Justice Investors increased its stake in the hotel from 50% to 93%, cashing out minority owners at an implied hotel valuation of $182 million. The Hilton has mortgage debt of $117 million. Using the lower end of my valuation estimate, the hotel’s net value is $58 million, making Portsmouth’s 93% ownership stake worth $53.9 million. Portsmouth also has various other assets, including $3.3 million in unrestricted cash and $4.0 million in marketable securities. However, 88% of these securities are common shares of Comstock Mining, a chronically unprofitable gold and silver miner. I value these shares at zero, leaving marketable securities of only $0.5 million. The company also holds a small amount of “other investments,” but there is no visibility toward the nature of these holdings and I think it better to ignore them. Against these assets, Portsmouth owes $8.9 million in notes payable, including $4.3 million to its ultimate parent, InterGroup. Portsmouth Square also incurs annual SG&A costs of around $0.7 million. I value this ongoing liability at negative $5.8 million, net of tax. Sum it all up and you arrive at a valuation of $43 million for Portsmouth, or almost $59 per share. The stock lasted traded at $55.50, so it looks like the market is largely in agreement with this valuation. (I pulled a quote after I did the valuation, I swear.) My estimates were fairly conservative, so it’s possible that Portsmouth is worth quite a lot more. For example, using a $210 million valuation for the hotel and assuming the Comstock stock is actually worth its balance sheet value, Portsmouth could be worth as much as $108! Clearly, the company’s value depends greatly on the value of its hotel, magnified by the significant leverage the mortgage debt provides. It gets easier from here. 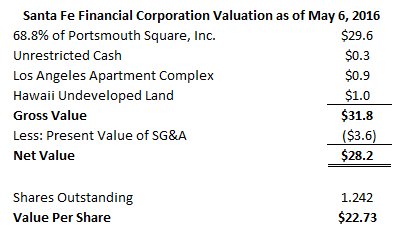 In addition to its 68.8% ownership interest in Portsmouth, Santa Fe owns some corporate cash and a 55.4% interest in an apartment complex in Los Angeles, plus some undeveloped land in Hawaii. Portsmouth’s assets and liabilities are consolidated on Santa Fe’s balance sheet, so naturally we must back these out to see what Santa Fe actually owns. Santa Fe reports $3.4 million in cash, but only $0.4 million is Santa Fe’s. The rest belongs to Portsmouth. Similarly, Santa Fe reports $6.1 million in marketable securities, but again, it’s nearly all in Comstock. Santa Fe’s non-Comstock, non “other investments” investment securities are de minimus. The apartment complex produces only a little over $0.3 million in net operating income annually. I value the property at $5 million. There is $3.3 million debt on the property, making Santa Fe’s stake worth $0.9 million. Santa Fe’s undeveloped Hawaii property’s cost basis is $1 million, so I’ll take that as the value. Santa Fe has no other substantial non-Portsmouth liabilities, and incurs annual SG&A expenses of only around $0.4 million. Valuing the ongoing SG&A at negative $3.6 million yields a value of $28.2 million, or $22.73 per share. But wait, the last trade for Santa Fe was at $35.00! Looks like the market thinks far better of the company than I do. Then again, using less conservative estimates for the value of Portsmouth Square gets me to Santa Fe values in the $60-70 range. Once again, it comes back to what the Hilton is really worth. InterGroup has the standard cash and marketable securities, but also has some more substantial real estate assets. Cash (net of Portsmouth and Santa Fe’s balances) is $1.7 million. Marketable securities are $4.9, once again excluding the complex’s significant holdings in Comstock and the murky “other investments.” The company also has a $4.3 million loan outstanding to its subsidiary, Portsmouth Square. InterGroup’s real estate assets include 16 apartment complexes, one commercial real estate property, vacant lots, and three single family residences in the Los Angeles area. The single family residences are categorized as “strategic investments.” This seems dubious to me, but at least the value of the single family residences is small compared to the multi-family properties. The value of InterGroup’s real estate is actually quite substantial. In fiscal 2015, the properties produced $7.7 million in NOI. This figure declined slightly to $7.5 million for the twelve trailing months. At a 6.5% cap rate, these properties are worth a cool $115 million. These properties carry debt of $62.2 million, for a net value of $52.8 million. I’ll bump that value to $55.8 million to credit the company for its non-revenue producing land investments. 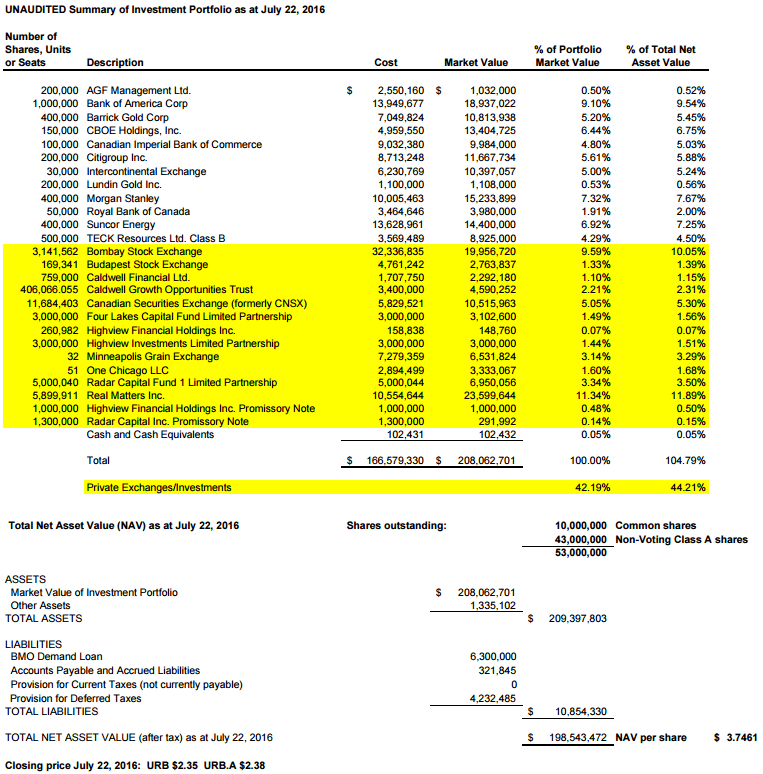 As for liabilities, InterGroup owes $1.6 million in margin debt on its investment securities. SG&A expense amounts to a little under $2 million per year, which I estimate is worth a negative $9.7 million, net of tax. The net value of InterGroup’s assets comes to $86.3 million, or a little over $36 per share. You may notice I assign no value to the ownership stake in Santa Fe, net of Santa Fe’s ownership in Portsmouth Square. That’s because without Portsmouth, Santa Fe actually has a negative value as a going concern. The reason that value to InterGroup is zero, not negative, is because InterGroup has no need to fund Santa Fe in any capacity and is not a guarantor on any of Santa Fe’s liabilities. The last trade in InterGroup stock was at….$$26.01. So here’s truly undervalued security of this complex. Per usual, it’s the ultimate holding company that receives the greatest discount. While I think that InterGroup trades at a large discount to conservative reckoning of its asset value (valuing Comstock at today’s market value would add almost $5 per share to InterGroup’s valuation) the company does have some substantial drawbacks. First, liquidity. InterGroup has a float of only around 800,000 shares with a market value of only $21 million. Accumulating these shares, not to mention selling them, is extremely difficult. Second, InterGroup and its related companies are tightly controlled by insiders with a love for investing a substantial portion of the company’s resources in penny mining stocks. Maybe that will work out great…but I wouldn’t count on it. And finally, the value of all three companies will be profoundly influenced by the California real estate market, San Francisco in particular. I don’t have any view about which way that market will go, but it is certainly a risk. 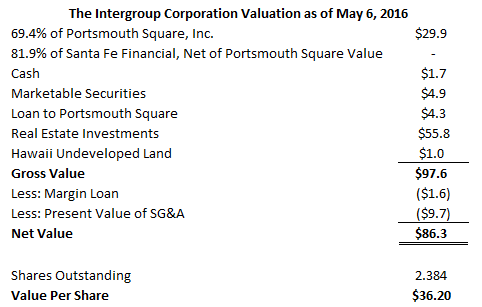 Alluvial Capital Management, LLC does not hold shares of InterGroup, Santa Fe Financial, or Portsmouth Square for client accounts. Alluvial may buy or sell shares of InterGroup, Santa Fe Financial, or Portsmouth Square at any time.